Mr. James Robert Whitehead, age 66 of Greensburg, Kentucky, son of the late Jessie James Whitehead and Nora Allie Scott Whitehead, was born on Monday, April 30, 1951 in Jefferson County, Kentucky and departed this life on Monday, January 1, 2018 at the University of Louisville Hospital. He was 66 years, 8 months, and 2 days of age. He had made a profession of faith in Christ and was a member of the Christian Worship Center in Horse Cave. Survivors include two daughters and a son-in-law: Angie and Toby Bolin of Cave City, and Shaunna Whitehead and her boyfriend, Steven Mitchell both of Campbellsville; two sons: Robby Whitehead and his girlfriend, Corrie Padget both of Sanora, and Leslie Whitehead of Campbellsville; a sister: Martha Edwards of Greensburg; two brothers: Herman Whitehead of Louisville, and Thomas Whitehead of Greensburg; 11 grandchildren; three great-grandchildren; and a host of other relatives and friends. 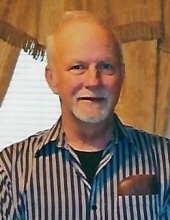 Mr. Whitehead was also preceded in death by a son: Robert Dewayne Whitehead; a grandchild: Zayden Whitehead; and two brothers: Harvey Whitehead and James Leslie Whitehead. The funeral services for Mr. James Robert Whitehead will be conducted at 11:00 A.M., Central Time, Thursday, January 4, 2018 at the Cowherd and Parrott Funeral Home with burial to follow in the Mt. Sherman Cemetery in Larue County. Bro. Danny Sallee officiating. Visitation is requested from 3 P.M. until 8 P.M., Central Time, Wednesday at the Cowherd and Parrott Funeral Home and after 7 A.M., Thursday until time of the funeral service. To plant a tree in memory of James Robert Whitehead, please visit our Tribute Store. "Email Address" would like to share the life celebration of James Robert Whitehead. Click on the "link" to go to share a favorite memory or leave a condolence message for the family.